In 2007, Shyamlal Yadav, then a senior journalist with India Today magazine, decided to use the RTI law, enacted only two years ago, to find out the details of foreign trips made by union ministers. Foreign travel is expensive, time consuming and, more often than not, does not serve any real purpose. Yadav wanted to know which minister travelled how much. It took him 59 applications and appeals (excluding the ones filed for the follow-up) – and four months – to find out. At least three ministries did not respond. In the end, with the replies he received from the PMO, the cabinet secretariat and various ministries, it was revealed that 71 union ministers had totted up airmiles equalling 256 circumambulations of the globe. All in three and a half years. The story appeared in the magazine in February 2008 with the headline ‘Frequent Fliers’. It was widely followed by other newspapers and TV channels. Then prime minister Manmohan Singh was constrained to ask his ministers to curtail foreign travel. This was the first story that Yadav broke using RTI. Since then, he has kept up his relentless quest to find out answers to niggling questions that governments may not want to answer. In 2016, Yadav, now with The Indian Express, was tipped off that bank managers or staffers were being made to deposit a rupee in some accounts opened under the prime minister’s flagship Jan-Dhan scheme. The idea was to bring down the number of accounts with zero balance. Again, he filed a series of RTI applications with a number of banks to find out the number of accounts with balance ranging from zero to less than Rs 1 to less than Rs 10 and so on. Some of the answers came in, and he followed it up with visits to villages where Jan-Dhan account holders told him they hadn’t deposited anything but their accounts came to hold Rs 1 each mysteriously. In September 2016, his newspaper ran the story of how bank staffers were being told to window-dress statistics by making small deposits into Jan-Dhan accounts. Curiosity, that quintessential journalistic spur, followed by patient RTI work and painstaking perseverence that took him to villages in UP to find out what really was happening made the story eminently readable. 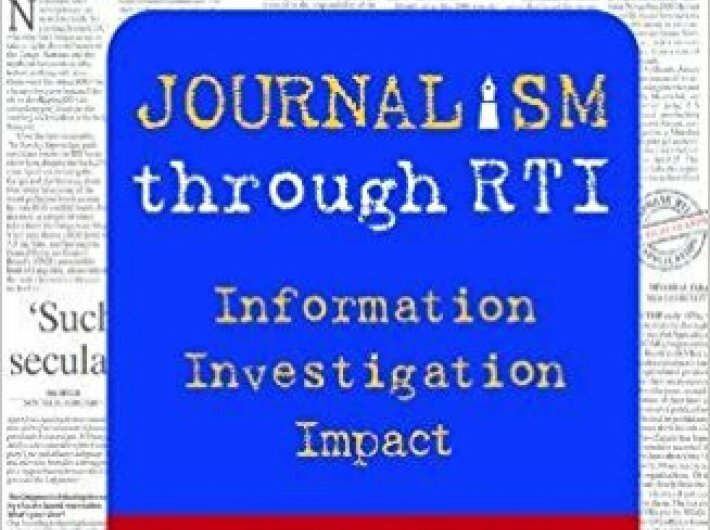 “RTI has taken me through a protracted, time-consuming and often frustrating journey, which after all makes for interesting reading,” he writes in his first book, ‘Journalism through RTI’, a hands-on manual on how to go about using RTI. 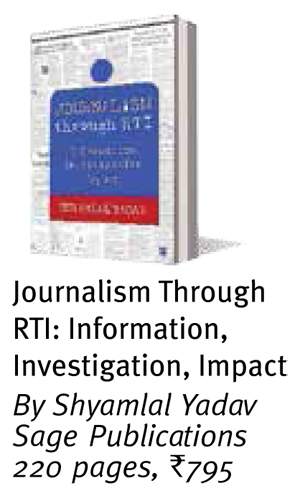 Yadav continues to use (and refine the use of) RTI for journalism. In his advance praise for the book, Satyananda Mishra, former chief information commisioner, says, “Yadav has married information to its rightful bride, the newspaper, and transformed it into an instrument of social change.” Such words, coming as they do from a former chief information commissioner, ornament and highlight the worth of what is essentially a no-frills book that sets out how one man extracted information in the public interest from the coils of red tape – and how you could do it too, with some persistence. The book is divided into 11 chapters. In the initial pages, Yadav traces RTI to the concept of freedom of information and provides a comprehensive history of the idea. We learn that Sweden implemented it as early as 1766, during the rule of Adolph Frederick. Later, in the 20th century, the United Nations recognised the idea of freedom of information after World War II. The US implemented it 200 years after Sweden, in 1966. Pakistan was ahead of India: it got a freedom of information law in 2002. In India, the UPA-1 government had it enacted in 2005. Neighbours Afghanistan, Bangladesh, Bhutan, the Maldives and Sri Lanka have RTI laws similar to ours. The first chapter also discusses at length the role of the media in bringing out information. It speaks highly of the efforts of activists like Subhash Agrawal, an advocate who like Yadav himself is a champion at using RTI to extract information that citizens ought to know. The book is a veritable library of case studies: of interesting and apparently not so interesting (but relevant) questions Yadav has found answers to. He recalls trying to get an idea of how clean India’s major rivers were: he filed 39 applications and appeals for over a year with the ministry of environment, forest and climate change, the central pollution control board, the central water commission and various state pollution control boards. The resulting story traced the journey of the Ganga Action Plan of 1986 as well as every river covered under the National River Conservation Plan (NRCP) since 1995. Some of his other journalistic stories, narrated in this book, include those on a secret list of empowered group of ministers, iftaar parties at public expense, and corruption cases against bureaucrats. The chief public information officer of IIT Kharagpur once wrote to him that the RTI Act “...confers right to information on all ‘citizens’ and not all ‘persons’. The citizenship can only be a natural born person and it does not even by implication include a legal or juristic person. Hence you being a person of The Indian Express, New Delhi, are not entitled to seek any information under the RTI Act.” Such is the reluctance to part with information, and such are the excuses on offer. On the other side, like habitual non-serious litigants and election contesters, there has emerged a new brand of busybodies – the sort who want to know, say, how many bricks went into the building of a new government structure. On one occasion, as Yadav writes, an applicant asked about the number statues of Gandhi, Nehru and 60 other personalities installed in the country. He even asked whether his own statue could be installed somewhere. “Public authorities find it difficult to provide information to such queries and their concerns may be genuine, because many such applications can be quite disconcerting and wastage of time,” he writes. As for politicians, he says “... no senior political leaders have been known to express the fear of the use of RTI by media. There are, of course, complaints and criticism of excessive use by people who misuse the law as well.” And as for the Narendra Modi government, he says it shows “no sign that [it] wants to weaken the RTI Act”. However, he cautions that “there are several officials who have started taking RTI provisions casually after the change in regime”.